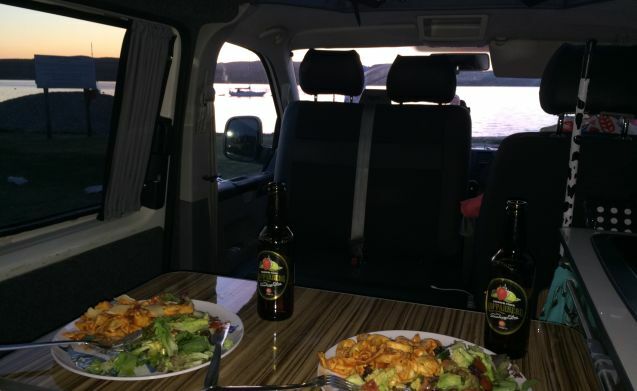 Bert is our 2004 VW T5 SWB van which was converted to a campervan in 2014 by Caledonian Campers so he has all the mod cons to make your trip as comfortable as possible. As he is a Short Wheel Base van he is easy to drive around even the narrowest of country roads and ideal for those with little or no experience in driving a van. Bert has 3 or 4 layout options which we will demonstrate to you before you set off. With all seats front facing and 5 seatbelts he can transport up to 5 people. 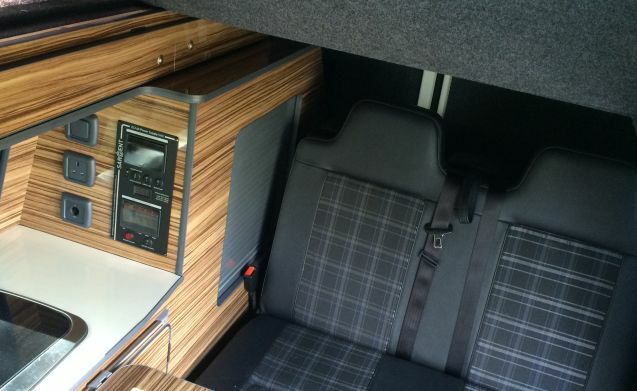 Once you’ve reached your destination, the front double seat can be spun round and his top popped up with ease to create a great living space with plenty of head room, ideal for chilling or cooking. A table can be fitted in between both double seats so 4 can sit comfortably around the dining table for dinner. 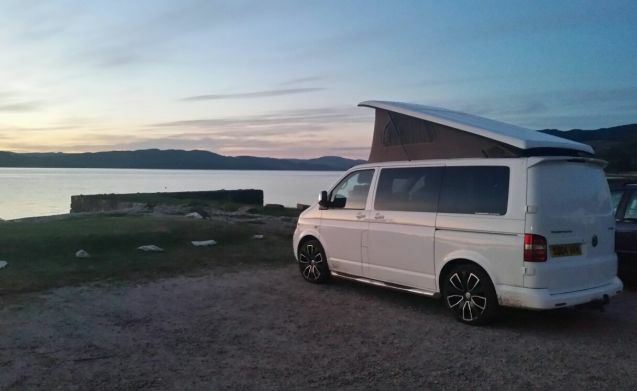 For sleeping, he can accommodate up to four people, with two on the rock and roll bed ‘downstairs’ and two on the pull down bunk bed in the pop up top. 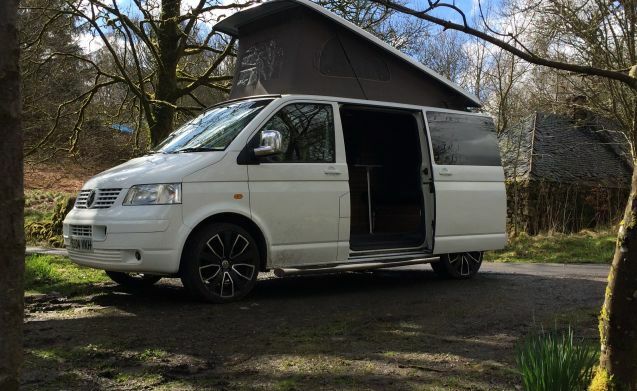 He is fitted with a 2 ring gas burning hob for cooking, a sink with cold running water and a good sized 50l fridge which can be run from the leisure battery while wild camping. 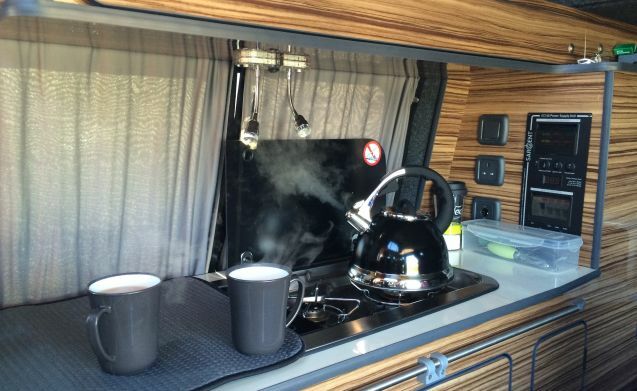 He has a fully stocked kitchen with everything you might need for cooking meals and even enough tea, coffee, milk and sugar for that all important cuppa on your first morning in the van. 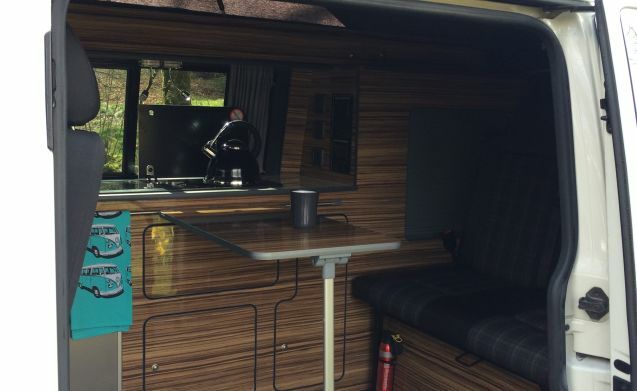 Bert is fitted with a 240v electrical hook up allowing you to connect to electric systems in campsites and a domestic socket so you can bring any of your own electrical devices that you just can’t live without. He also comes with outdoor table and chairs for alfresco dining or just relaxing outdoors with a glass of wine as you enjoy the views. Bert comes with fully comprehensive insurance for two drivers aged 25 - 70 and comprehensive AA breakdown cover. For availability and full terms and conditions please contact us!